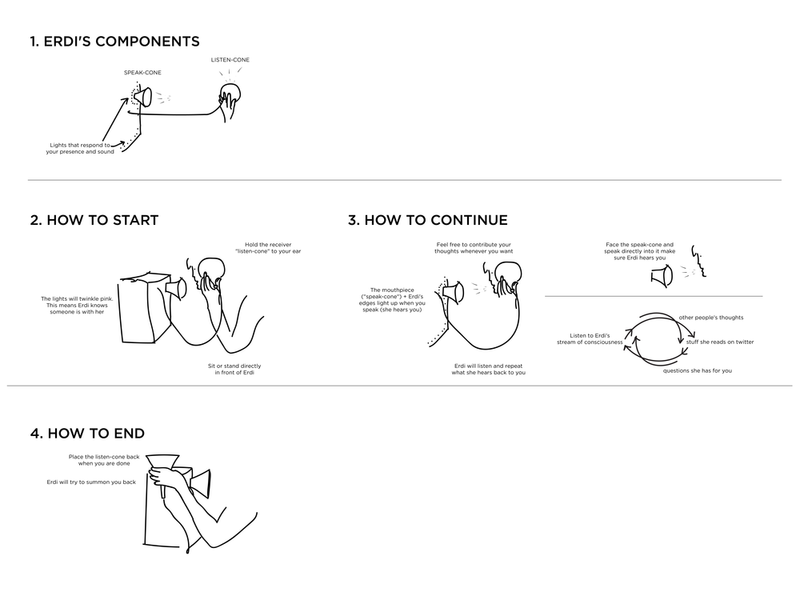 Based on what we learned at the CLICK festival, we made another iteration of the devices for reflection and asynchronous dialogue for the Made in Space festival at Space10. One of the festival themes was “coexistence”, and many different installations had different, provocative angles on this topic. In this iteration of our reflective devices, we exposed and focused on coexistence in Europe — continuing our CoHERE thread and theme of how diverse people can live together in the changing European landscape. How could we invite visitors to openly express their opinions and reflect on the thoughts that other people have left? We created a special device that is embodied by a custom-designed voice, "Erdi" (which is how the abbreviation R.D. is pronounced by the computer) - who engages the visitor in a discussion on "coexistence." Erdi shares a few thoughts that have been left so far about coexistence and then asks the visitor to say what they think. While Erdi follows a specific flow, Erdi is also listening for input and has a logical series to follow for the conversation. Over time, Erdi fills with thoughts and recollections that people leave behind in their discussions with Erdi (and, asynchronously, with one another - in that each person hears what others have said thus far). Overall, Erdi is a recorder and reflection of the visitors own experiences and feedback on the themes of the exhibitions and talks. The white cones look the same so it seems like they would have the same function - people are confused about which is for speaking and which is for listening. There should be a play mode / serious mode - so people could get used to the unusual and audio-only "interface"
Code for the prototype is here.